A gomphosis is a fibrous joint that binds the teeth to bony sockets in the bones of the maxilla mandible. The gomphosis is the only joint type in which a bone does not join another bone, because teeth are not technically bone. The motion of a gomphosis is minimal, though considerable movement can be achieved with pressure over time, which is why using braces can realign teeth. One disorder that can affect the gomphosis is scurvy, which is a disease of connective tissue. scurvy: A disease resulting from a lack of vitamin C.
synarthrosis: A type of joint in which two bones are connected rigidly by fibrous tissue. 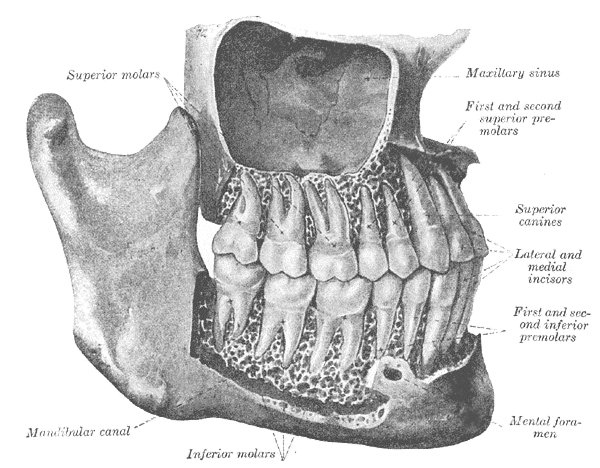 gomphoses: A joint that binds the teeth to bony sockets (dental alveoli) in the maxillary bone and mandible. A gomphosis is a joint that anchors a tooth to its socket. Gomphoses line the upper and lower jaw in each tooth socket and are also known as peg and socket joints. These joints have a very limited range of mobility so the teeth are held firmly in place. However, as illustrated with braces, it is possible to move them incrementally over time. Each tooth has bony protrusions or pegs that latch into the socket with the assistance of the gomphosis. Disorders of the mouth sometimes involve these joints. Gomphoses: This image illustrates the gomphoses joints of teeth within the jaw. This particular joint is an example of a synarthrosis, a joint with limited to no movement. Several other joints of this type can be found in the body, including the connections between the plates of the skull. The gomphosis is made up of fibrous tissue, a collection of tough ligaments that attach to the socket and base of the tooth. As people age and lose their initial set of baby teeth, the new teeth develop gomphoses to anchor them in the jaw. One disorder that can affect the gomphosis is scurvy, a disease of connective tissue. Connective tissues such as the ligaments around the teeth start to dissolve. Patients with untreated scurvy develop loose teeth that may eventually fall out because the joints are too unstable. Periodontal infection and inflammation can also damage the joint, causing pain and erosion in the soft tissue. Chronic dental problems may loosen the ligaments and lead to tooth loss or instability. Patients with braces and retainers take advantage of the limited range of movement offered by the gomphosis to pull teeth into new positions. This may be necessary for a variety of reasons. The goal is to align the teeth evenly to create a strong, healthy bite. Braces are adjusted incrementally over time to pull and push the teeth into place. Between each adjustment, the teeth and jaw have time to recover.